RUSSIA. 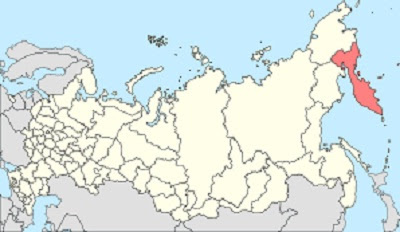 In the remote Kamchatka peninsula (map below), 200 km from Tigil, University of St. Petersburg archaeologists discovered a strange fossil. The authenticity of the find has been certified. According archaeologist Yuri Golubev, occurs that, in this case the discovery surprised scientists by its nature, at least – unusual, able to change history (or pre-history). We got a call from the prefec of Tigil. He told us that hikers that were walking in place, found these remains in rock. We went to the place indicated, and initially we not understand what we saw. There were – hundreds of toothed cylinders which appeared to be parts of a machine. They were in perfect state of conservation, as if they were frozen in a short period of time. It was necessary control the area, because soon the curious began to appear in large numbers. Other scientists, americans geologists, defined the piece as an amazing and mysterious artifact. It was found also that the parts have reached to the fossilization state in a period of time historicaly and geologically short. Possibly, the “machine” fell into a swamp. Despite the findings, cautious, scientists prefer to consider that the evidences are not definitive – yet. And Gobulev ponders: Refuse the existence of technology [even in past as indented] is a serious mistake because evolution is not linear.